Sharepoint 2010 has become a very stable platform these days, because of this, many firms have decided to transform Sharepoint into a Document Management System (DMS). 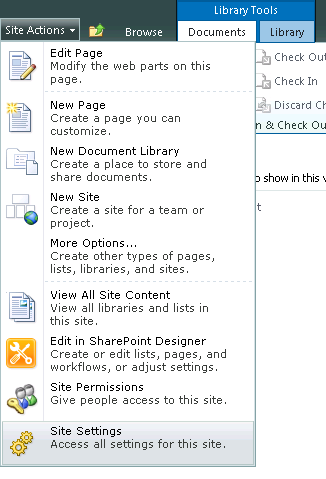 As we know, Sharepoint is so flexible we can achieve anything we want with it, but in this case we have to focus in usability and performance. We can not forget that at the end of the day, a DMS is a very sophisticated virtual hard drive full of virtual files. I am going to publish a step by step guide of how to setup a complete DMS for a medium size company reaching high performance levels of interaction with documents. Fisrt of all I think we need to understand what a Document Management System means. This paragraph is a very good description of a DMS. A document management system (DMS) is a computer system (or set of computer programs) used to track and store electronic documents and/or images of paper documents. The term has some overlap with the concepts of content management systems. It is often viewed as a component of enterprise content management (ECM) systems and related to digital asset management, document imaging, workflow systems and records management systems. A little bit of history. Beginning in the 1980s, a number of vendors began developing software systems to manage paper-based documents. These systems dealt with paper documents, which included not only printed and published documents, but also photographs, prints, etc. Later developers began to write a second type of system which could manage electronic documents, i.e., all those documents, or files, created on computers, and often stored on users' local file-systems. The earliest electronic document management (EDM) systems managed either proprietary file types, or a limited number of file formats. Many of these systems later[when?] became known as document imaging systems, because they focused on the capture, storage, indexing and retrieval of image file formats. These systems enabled an organization to capture faxes and forms, to save copies of the documents as images, and to store the image files in the repository for security and quick retrieval (retrieval made possible because the system handled the extraction of the text from the document in the process of capture, and the text-indexer function provided text-retrieval capabilities). EDM systems evolved to a point where systems could manage any type of file format that could be stored on the network. The applications grew to encompass electronic documents, collaboration tools, security, workflow, and auditing capabilities. A content type is a reusable collection of metadata (columns), workflow, behavior, and other settings for a category of items or documents in a Microsoft SharePoint Foundation 2010 list or document library. Content types enable you to manage the settings for a category of information in a centralized, reusable way. For example, imagine a business situation in which you have three different types of documents: expense reports, purchase orders, and invoices. All three types of documents have some characteristics in common; for one thing, they are all financial documents and contain data with values in currency. Yet each type of document has its own data requirements, its own document template, and its own workflow. One solution to this business problem is to create four content types. The first content type, Financial Document, could encapsulate data requirements common to all financial documents in the organization. The remaining three, Expense Report, Purchase Order, and Invoice, could inherit common elements from Financial Document and also define characteristics unique to each type, such as a particular set of metadata, a document template to be used in creating a new item, and a specific workflow for processing an item. Each of the content types in this example could be used on any document library in the site hierarchy, and all of them could be used together on the same document library. When business requirements change, the content types can be modified to meet the new requirements and updates can be pushed down to any document library where the content type is used. So from here we are going to create our own content type, it is based in our bills, so it will be called "Bill"
1- Go to your site, and on Site Actions menu click on "Site Settings"
2- Under "Galleries" you will find an option called "Site Content Types", click on that link. 3- Click on "Create" and a new page will pop up. 4- Under "New Site Content Type", on the name text box type Bill. 5- On "Document Content Types" select "parent content type" and select Document, click Ok.
6- Go to the library where you want to use the content type, "Share Documents" in this case and select the ribbon Library, on there select "Library Settings". 7- From here, click on the name of your content type "Bill", select "Advance Settings" , select Upload a new document template, and then click Browse to browse to and select the document template you want to assign to the site content type. A document template can be any file such as an Excel spreadsheet, a Word document or template, a PowerPoint slide presentation, etc. 8- Navigate to the document library to which you want to add the content type. 9- On the Settings menu, click Document Library Settings. 10- On the Customize page under General Settings, click Advanced settings. 12- Back on the Customize page under Content Types, click Add from existing site content types. 13- On the Add Content Types page, select Custom Content Types from the Select site content types from drop-down list box, select the content type you created (here: Bill) from the Available Site Content Types drop-down list box, click Add to add the content type to the list of Content types to add, and then click OK.
14- Go to your library, select the Ribbon Document and select "New Document" you should be able to see the new document, "Bill". As you can see we can be quite flexible adding content types, but this is just the beginning , in the next part I will extend more options available. Finally, realize how much money you can be making by being an affiliate marketer. This is someone who can make lemonade out of lemons. NNEP President and conference organizer. a woman. Italian women are also generally cultured and loquacious, enthusiastically carrying on conversations, especially on topics of their interest. I don't go along because I have to stay inside with the cordless phone ready to dial 911. Online24x7,one of the best software development companies in Gurgaon, provides various web services which may increase your business and reduce the cost of your business. We deliver best software with ease of accessibility and we have proficient software developers. Payroll Software, leave management, Time tracking software etc.